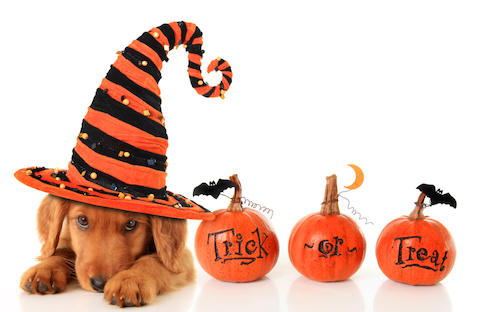 Veterinarians also advise pet owners to keep pets away from the Halloween festivities. Some animals become distressed by the change in environment and the increased noise of doorbells and trick or treaters may cause pets to act out of character, resulting in an animal biting or escaping. While pets might look cute in costumes, costumes that do not fit well can obstruct your pet's ability to move, hear, or even breathe. Pets that do not like wearing a costume can become quite stressed in the effort to remove it. Be aware of elastic and other costume fasteners that can become caught on your pet. Another thing to consider are the safety hazards to pets and your entire family when pumpkins and candles are lit. Pets may knock these items over resulting in your pet being burned or other items catching on fire. Remember, your pet counts on you to keep him healthy and safe. Share your Halloween with him in ways that he will enjoy.